MJ Jensen is the Chief Idea Officer and Visionary Leader for IdeaMagic Digital Marketing Solutions. She is passionate about helping businesses grow, clarifying their brand and message, and having fun. Shawn Campbell, owner of Campbell Marketing Group, is a graduate of the U of A with a Bachelor’s in Marketing. He has many years of experience in marketing for small businesses to major corporations, including social media analyst for Kia Motors America. Brian Lawson is one of the co-founders of WebMO and has been a digital marketer, technologist, “IT guy”, and a local business owner for over 28 years. He has presented WebMO’s digital marketing research findings at conferences, workshops, associations, and local events across Arizona. 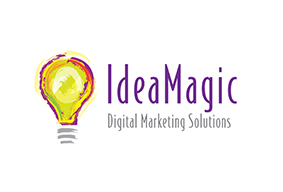 IdeaMagic Digital Marketing Solutions solves marketing problems using ideal strategies for every business and industry. *There is a large parking lot around the back side of the building if the lot in front is full.